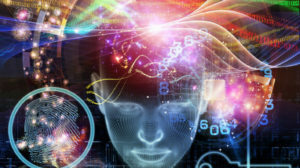 Mind4Survival: Helping to Develop Your Mind4Survival. Have you ever been the victim of a crime, been caught in a disaster, or found yourself unable to pay a bill? What about any number of other less-than-ideal situations? I hope not. If you're like many of us though, your security, safety, and preparedness, all parts of your Mind4Survival, have been challenged. Unfortunately, I’ve been caught in all those events and personally know how much they stink. What stinks, even more, is that I am an educated and trained professional who could have avoided them but didn’t. Why didn’t I? Well, in the military, we called it taking the path of least resistance. The post-military world calls it being lazy. In a nutshell, I knew what to do to make myself more secure but didn’t. I had a Mind4Survival but ignored it. Sadly, because I was lazy about my security, finances, etc., I paid the price. Because of those experiences, I've made it my mission to help you avoid taking the path of least resistance. We’re starting that purpose, the mission to put you on the right track, right here and now. Not too many years ago, I received one of those phone calls that no one wants to hear. The call was from my roommate telling me that my home had been robbed. Not only was my house robbed, but my safe full of family heirlooms and other personally priceless and irreplaceable valuables were gone. It was wheeled out the front door and forever lost. The culprit, in this case, was a paroled, career criminal. He had just served a laughable two-year prison sentence for breaking into and robbing over two hundred homes. In the thirty-some days following his release, he managed to ransack the lives of 60 other families. Sadly, this type of situation is increasingly the rule rather than an exception to the rule. In today’s world, we are subjected to severe conditions like never before. Whether it is from someone breaking into your home, a natural disaster, or other events, we are all potential victims. However, we don’t have to be. We can take charge and prepare for any eventuality. All it takes is thinking, mixed with a dash of personal action, and we can all be ahead of the game. There is no way around it; crime is on the rise. The reason for the increase in crime doesn’t matter. We (you and I) can’t make criminals stop being bad guys. What we can do, though, is make ourselves less desirable targets. All one has to do to see the rise in crime is to look at the numbers. 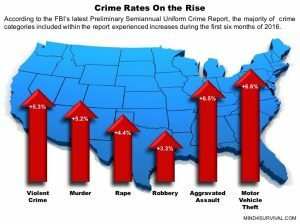 The growing number and escalating trends are captured in the FBI’s latest Preliminary Semiannual Uniform Crime Report. These statistics represent the millions of reported crimes that occur within the U.S. With stats like these, imagine what the numbers would look like if the millions of unreported crimes made it into the report? I’m pretty sure we’d all be shocked by what the stats revealed. Imagining what each percentage point in the FBI statistics represents can also be shocking. Each one is a person or family just like ours, who has been targeted by criminals. Together, those percentages show that millions of individuals suffer from crime. While not all crimes are preventable, many are avoidable if people veer away from the path of least resistance. It is here where you’ll learn to avoid that route and minimize dangerous situations as much as possible. Natural disasters are an ever-present danger worldwide. According to Disaster-Survival-Resources.com, natural disasters have impacted 250 million people in the past decade. Disasters alone have cost the U.S. over $1 billion in the last thirty years. One key to preparing for disasters is to understand that they may occur with little warning virtually anywhere on the globe. Within just the United States, we are vulnerable to and have experienced a host of disasters that include avalanches, droughts, earthquakes, fires, floods, hurricanes, landslides, pandemics, solar storms, tornados, tsunamis, volcanoes, and violent winter storms. Any of these may strike anywhere, at any time, and with little to no notice. Many people don’t know it, but the most significant earthquake to hit the United States was not in California. The most massive earthquake in U.S. history happened in New Madrid, Missouri, on February 7, 1812. This monster quake was an 8.8 magnitude earthquake, which was preceded by an 8.1 earthquake and another 7.8 on the Richter scale. If you’re interested, Live Science provides a good overview of The 10 Biggest Earthquakes in History (dating back to 1900). So, what does a 200-year-old earthquake have to do with you? It shows how our world, much like the people in it, are unpredictable. There are obviously no guarantees about Mother Nature or people. Therefore, it’s up to us to prepare for the worst, while hoping for the best. We all tend to think of security as it relates to crime. However, when it comes to personal security, we must consider other potential problems that could negatively affect us. One area we should all think about is financial security. Financial security means working to get our finances under control. If they are under control, it means keeping them that way. Like many people, I’ve had times where I didn’t have two pennies to rub together. Those times were horrible. If you’re in those times now, you have my sympathy and understanding, and please know this: You can get out of them. It takes sacrifice, dedication, and a whole lot of patience. Once you do get out of them, though, you will be in such a better place! It is those hard financial times that make me appreciative of what I have. Honestly, without those times, I wouldn’t know how lucky I am today. Taking care of your finances is an essential part of personal security for several reasons. Being on top of your finances is much less stressful. Less stress is enormous! Stress feeds into your attitude, health, and so much more. The more stress you have, the more it interferes with other areas of your life. Poor financial health also reduces your ability to address your security, safety, and preparedness needs. You don’t need to be rich, but being financially stable does help. I can go on and on about the impact of finances. Heck, if you’re reading this and you have money problems, you know the deal all too well. You don’t need me to preach to you. What you do need to know is that there is light at the end of the tunnel. You can conquer this! One person who may be able to offer you some help is Dave Ramsey. When you have time, take a look at his site and give his podcast a listen. He has a lot of information that you may like and find useful. Just like your finances, your health is another area that is important for your security. Improving security, safety, and preparedness becomes much more difficult if we aren’t in the best of health. We all can’t be entirely healthy, and we all have health issues from time to time. What is important is that we try to be as healthy as we can be. As in the other areas, I have very personal knowledge of this. For all my life, I have been very healthy and reasonably fit. When I was in the military and working for the fire department, I was incredibly fit. That was until I became rooted to a desk and only focused on my job. I bought into the idea that I didn’t have time to work out and that my job was more important than my health, but it wasn’t and never will be. Once I went down that rabbit hole, I began to eat much less healthy. Then, because I love to eat, I ate a lot. So, like many of us, I packed the food in my mouth and added on the pounds. That led to sore knees, lousy lab work at the doctor's, etc. It all could have been prevented. The crazy part on my end is I knew what to do. My best friend growing up is a lifelong personal trainer, and I’m a paramedic. I knew what to do. I had the information and resources right in front of me. Most of us know what to do. If we aren’t 100% sure, the internet is a click away, and a doctor is a phone call away. Please, please, please take the time to see your doctor. If you have any health issues, work with your doc to get them resolved. After talking to your doctor about it, get up and start moving. Moving doesn’t mean going to the gym every day. Moving means taking a proactive approach to improving your health and fitness. That proactive approach can be some daily stretching followed by a walk each day. Whatever you do, give it a shot if you’re able. Had I not followed the path of least resistance, I would have made sure I stayed in shape. I would have adjusted my workouts to my schedule or vice versa. Had I done that, I wouldn’t be slowly clawing my way back to fitness now. The key, though, is that I am and so can you. If you are there, congratulations, keep it up! It's much easier to maintain your fitness and health than to regain it after losing it, especially as you get older. Like with finances, I’m probably preaching to the choir. If you are like how I was, you are aware of it. Now, it’s time to do something about it. Just know that it's imperative for you and your family that you're as healthy as possible. Also, remember that you can put your health first and still get other things done. Don’t forget: the life you save when you stay or get healthy will be yours. Since you only have one, you better make it count. In addition to crime, finances, and health, many other areas of life can cause problems. These issues, if not prepared for, have increased chances of impacting personal security and safety. Unfortunately, it would take years to cover them all. What is important to understand is that any number of difficult challenges can impact all of us. That’s because Murphy is lurking around every corner and loves to throw us curve balls. Those curve balls can take many forms. In today’s world, people tend to focus on terrorism and other headline-grabbing events. The reality is we can all suffer from an array of problems. Fortunately, for us, many of those issues can be bundled into groups and prepared for accordingly. For example, terrorism and violent crime, while different, have some common characteristics. Therefore, when you prepare to face one issue, you are preparing to meet many. Likewise, the way you prepare to face one group of problems may have similarities to how you face others. Improving your situational awareness not only helps you avoid crime; it also helps prepare you for other challenges, too. In a nutshell, we can cross-leverage our security, safety, and preparedness efforts to cover a spectrum of problems. Cross-leveraging your capabilities allows you to turn small personal efforts into super great wins! It gives you the ability to make huge strides towards improving your situation with minimal input. That’s a great opportunity. The hardest part of figuring out how to get those wins is figuring out where to start. Fortunately for you, I’m here to help with that! As mentioned earlier, you should consider security as it relates to your finances, personal safety issues, health, etc. After all, is losing your belongings to a criminal much different than losing them to debt, disaster, or other challenges? Therefore, whenever you think of security, you need to think of it as 360° security: security that focuses on all aspects of your life. The key to success with 360° security is recognizing potential problems, analyzing their impacts, and deciding upon proper responses. Once you do that, you can meet the issues head-on, by taking action. Those who understand this, and who work to prepare themselves, will be better prepared to overcome any situation. They will be better able to survive and thrive when the odds are stacked against them. The Individual Security Condition (ISC) is a measure of how prepared you are to overcome crime, financial ruin, disasters, etc. It is the ISC that establishes your security baselines. These benchmarks become your all-in, actual security reality. 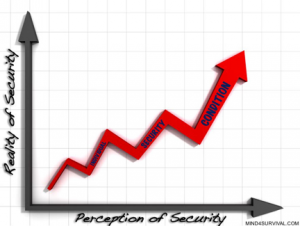 That fact occurs where your perception of security crosses the reality of your security situation. Your perception of security is the first leg of the ISC. It is the culmination of all the acquired security-related experience and knowledge you have gained throughout your life. When you have limited knowledge or experience, you may perceive yourself to be more, or less, secure than you are. Over time though, as you add new experiences and gain additional knowledge, your perception improves. As your ability to notice, analyze, and react to developing security issues increases positively, you become more adept at perceiving the actual reality of your security condition. The second leg of the ISC represents the actual reality of your security situation. This truth is a combination of factors. Together, these combined features interact to improve or degrade your security. These factors could include natural elements that add to your security reality, such as impassable terrain next to your home. Likewise, items such as bushes, which may provide concealment to a would-be burglar, detract from your security reality. Having either a high individual perception of security or a raised true reality of security is excellent. Unfortunately, each factor is dependent upon the other to provide an elevated ISC. For example, a home may have a significant amount of security equipment installed (the reality of security). However, not understanding when, why, or how to use the equipment (perception of security) adds nothing to a person’s ISC. Likewise, having an elevated perception of security is also great, but it doesn’t do much while you’re sleeping. Ultimately, due to their codependency, each factor of the ISC is limited by the constraint of the other. Simultaneously, the combined benefits of each allow us to achieve a higher ISC. In other words, a high perception of security, coupled with an elevated reality of security, creates an improved ISC rating. People with a higher overall ISC are better prepared to deal with challenges to their 360° security. As mentioned earlier, our perception of security is the sum of all our security-related experiences and knowledge. The improvement of our understanding of security through increasing experiences and education leads to enhanced situational awareness. In turn, this improved situational awareness allows us to recognize, analyze, and act in response to developing situations. One fundamental theory of situational awareness is the OODA Loop or Boyd’s Cycle. Boyd’s Cycle was developed by Colonel John Boyd to aid in the fast-paced decision-making processes needed for aerial combat. Colonel Boyd was a renowned U.S. Air Force pilot and military theorist. He used his OODA Loop theory as a method of explaining how pilots could better overcome and defeat their opposition. For us, this approach provides a way to overcome and conquer problems that arise. 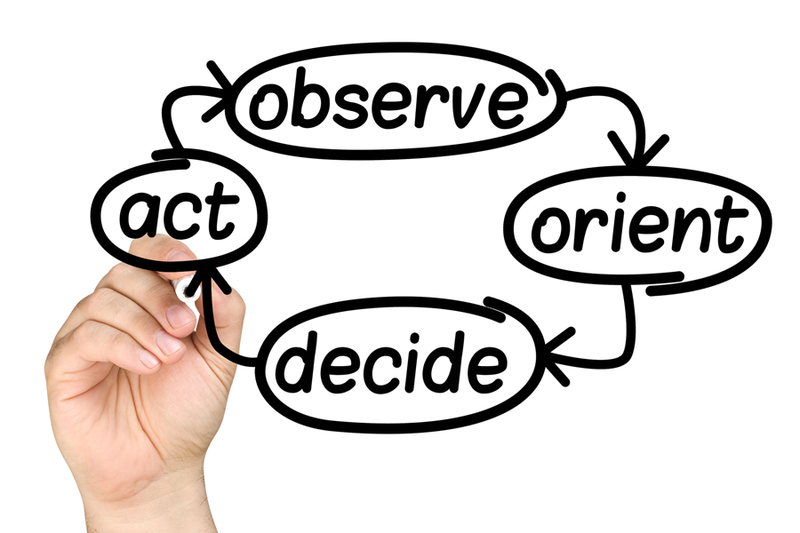 The OODA Loop, which stands for Observe, Orient, Decide, and Act, is an ongoing cycle of thought processes. It is used to facilitate our decision-making. Boyd proposed that people who can move through the OODA Loop more quickly can get an advantage over their opposition. In effect, the person who can observe and react to an ongoing situation more rapidly can better move inside of the opponent's decision-making process Doing so allows for the faster and more accurate decision maker to keep the opponent off balance, reactionary, and unprepared. In turn, the OODA Loop offers a better chance for success to the faster decision maker. There are a variety of inputs that occur as we, the decision makers, move through the OODA Loop cycle. During the first phase of the OODA Loop, the Observe phase, we receive information regarding the developing situation. Next, during the Orient phase, we apply our life experiences, knowledge, training, and other factors to our observations. Then, after we have molded our views, we decide upon a course of action. Finally, we carry out the action or actions as a response to the original situation. All the while, we receive feedback from the situation as it develops around us. This input may cause us to stop and begin the OODA Loop process again. However, it may also prompt us to continue through to the end. If it does, we then start it all over with our observations of the current situation. Simultaneously, as we noodle through our OODA Loop, our opposition is doing the same. They are doing it to get within our loop and outpace our decision-making process. Therefore, it is essential that we work to improve our OODA Loop abilities. By doing so, we are more likely to have the faster process, which translates into getting the upper hand on the situation. Improving your OODA Loop, which enhances your overall situational awareness, is relatively easy, especially if you're just starting out. Not only is it easy to improve upon, but it also doesn't require a lot of time to do so. What is needed, though, is for you to consciously make an effort to take action and improve your capabilities. So, what’s the big secret? How can you increase your situational awareness and subsequently improve your security, safety, and preparedness? First, start by paying attention to what is going on around you. Paying attention means not burying your head in your smartphone and texts. Take a break from social media when you’re out and about. Your friends won’t disappear if you don’t instantly “like” their post about Fluffy the cat. Next, when you’re driving, turn off your radio and instead tune into what happens in the world around you. I would mention putting down your cell phones when driving, but I already know you aren’t texting and driving, right?! Great question! So, let me ask you, what are those people doing? How are they acting? What does their body language tell you? How about their facial expressions? As my paramedic trainer said so many years ago, “The eyes are the gateway to the soul.” Well, what do their eyes tell you? It’s called non-verbal communication. Think about it: Animals don’t talk. When one is upset or nervous, we can tell from just looking. When I walk in the door from work, I immediately know if my Golden Retriever has destroyed the cat’s bed or something else in the house. He doesn’t stand up on his hind legs and say, “Hey dude, by the way, you know how I hate those cats? Well, I went and jacked up their little cat bed today. What are you going to do about it?” No, I walk in, and he’s curled up on the ground, shifting his eyes away from me and looking as guilty as sin. That’s called non-verbal communication. Fortunately for us and our situational awareness, people do the same thing. We all know it, and we all use it. What many of us don’t do is use other people’s non-verbal communication as an indicator of their intent. In the military, we called those indicators “pre-attack indicators.” Not all issues we are trying to detect indicate an attack, so don't think of it like that. What the indicators do is tip you off as to what may be happening or about to happen. For example, have you ever noticed another driver who seemed not all there, then a few seconds later he did something stupid? Did you avoid a possible wreck because of what you saw? I’m pretty sure most of you have. That’s what indicators tell us. They are a warning sign that is available for us to pick up on if we’re paying attention. It’s important to note that non-verbal communication is not limited to the living. No, I’m not talking about zombies. I’m talking about machines, plants, and the like. “What?! Machines talk to me?” Well, yes, inanimate objects do talk to you. When a car approaches you, you don’t have to see the driver to know it is accelerating way too fast. You can tell which way it’s going to turn by the slight change in the tire, or when it begins leaning to one side. You can look at a tree in a wind storm and have a good idea if it’s going to come crashing down. Just about everything can give you a clue or an indicator as to what it’s next course of action will be. Okay, so now what? Well, now your task is to do what you already do. It is time to take more notice of the non-verbal communication that goes on around you. Remember, it's much harder to see things when you're not paying attention. So, pay attention. The funny thing is, you’ll notice all the other people with their heads buried in their phones. After a bit, it may make you realize how much out of tune you were with your environment. Also, when you pay more attention, you’ll see the world around you. You may notice something you’ve been missing. It’s the world that, on the whole, is an incredible and beautiful place. Now, you may enjoy it more. One last thing on paying more attention. When you begin, it will take conscious action to do so. However, over a short time, it will become second nature. Eventually, you won’t even have to think about it. You will just begin picking up on those clues and indicators, no matter what is going on. So, go ahead, give it a try, and let me know what you think. Now, you’ve begun taking more notice of the non-verbal communication that goes on around you. What’s next? Next, is working on what your responses will be to those non-verbal indicators. That doesn’t mean you wait until you see a crazy person come screaming towards you. No, it means you pre-think through various scenarios. As you see a person walking towards you, you should ask yourself, what if? What if he were a crazy person who suddenly came screaming at me? What if the car driving in the other lane came across the median towards me? What if…? As you think about the what if’s, you are mentally game-planning possible reactions to those what if’s. When you do, you are pre-planning your responses to the situation. That way, you’ll already be familiar with your potential reaction when it’s time for action. It’s the same reason the military trains for an immediate response to a situation. That way, when a situation happens that requires an answer, you’ll respond quickly and efficiently. After all, you’ve already pre-gamed it in your mind, so you’re well ahead of the curve. Have you ever been the new person in some activity that was full of people with different experience levels? After working to improve yourself, were you still that new person, or perhaps one of the more experienced? Have you ever been the new person at a job where you felt like a fish out of water? The people around you seemingly knew the job inside and out compared to you. After several months, were you still the new person, or did you know what was going on? We can go on and on, but one thing is constant: Everyone starts out as the awkward, new person at some point. Everyone learns, and soon, after being the new person, we transform into the experienced person. The same applies to situational awareness. Identifying and interpreting indicators takes some work. Regardless of our ability to do so, we all have room for improvement. When we do improve upon our ability to understand indicators correctly, we will be more prepared to deal with what comes after. The more we practice observing, interpreting and game planning, the more proficient and faster-reacting we will be. Just like the people who are good at work, you can be good at situational awareness. As you get better, your decision making will become more accurate. So, too, will be the speed with which you make those decisions. Achieving those two goals will help you become much more secure, safe, and prepared. Does this mean we are always trying to out-plan and out-think people? Well, yes, it does, but it’s not the only thing. First, you want to out-plan the bad people. This could apply to thinking about how you would rob your home if you were a bad guy. Thinking about how the bad guys would do it allows you to work to counter their actions in advance. You’re trying to throw a wrench into their plans and impact the 5Ds we mentioned earlier. By realistically planning against yourself, you can see what your weaknesses are and work to counter them. When we plan, we don’t just focus on bad people. X can be anything. Perhaps it is a house fire. Maybe it’s a quick trip to the hospital. Heck, it can be avoiding a traffic jam. We can apply the principals of pre-planning and thinking through a situation to help overcome some issues. They don’t all have to be bad. However, by putting them into our mental process, we can identify situations sooner. Doing so will allow us to make quicker, more accurate decisions. Then, we can take action based on those decisions more quickly and expertly. It all fits into making you more secure, safe, and prepared to deal with any of life’s problems. You will face severe challenges in your life regardless of who you are or what your background is. Problems such as crime, natural disasters, financial difficulties, health issues and other things all can cause you and your family difficulties. Because there are so many challenges facing us, we must look towards a holistic approach to solving our problems. That comprehensive approach is 360° security. 360° security applies to all facets of your life and aids in avoiding or overcoming all the challenges that you face. To achieve 360° security, we first must understand our overall security situation. We do that through understanding our Individual Security Condition. We base our ISC upon a combination of our reality of security (actual security measures) and our perception of security (our understanding of our security). Both of those factors are simultaneously dependent upon and constrained by one another. It is up to us to move our ISC higher and higher. We achieve that escalation through increased training, education, and security preparations. Our ISC feeds into our situational awareness, which is based upon the OODA Loop process of Col. John Boyd. 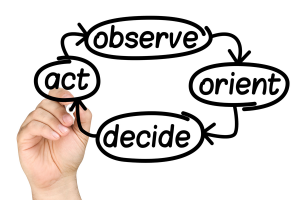 The OODA Loop is the process of Observe, Orient, Decide and Act. We move through that process, or loop, to out-think our opponents or a developing situation. By doing so, we are more likely to come out in a better position. One key to improving our situational awareness and the likelihood of positive outcomes is to pay attention. Paying attention requires us to look around and notice things in our environment. It compels us to see non-verbal communication and indicators that tip us off to a potential challenge or change in the state of our current situation. As soon as we understand what that problem or change in situation is, we are then able to make a proper decision. With the decision made, we can then take action. However, we should have thought through the scenario, or similar ones, long before the reality of the event occurs. By doing so, we will position ourselves to be better prepared to come out on top of the situation. As they say, practice makes perfect. That even applies to mental training. If you have any other thoughts or questions about developing your mind4survival, please leave a comment below.